Nice custom paint job on that outer space van. 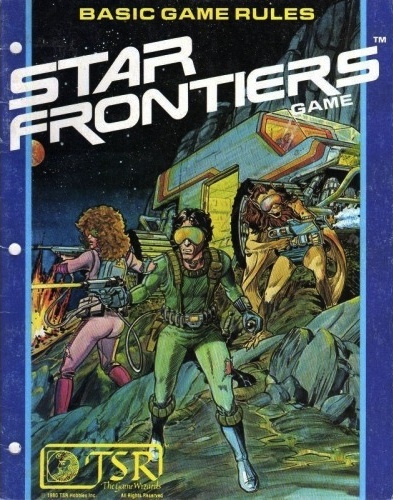 Star Frontiers was the first sci-fi roleplaying game I ever owned. As a kid I didn't get it. Back then I thought all things sci-fi flowed from two benevolent gods: Gene Roddenberry and George Lucas. 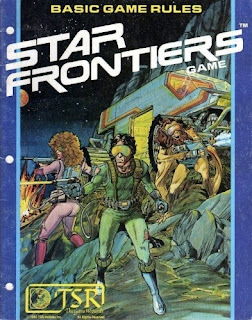 Neither Star Wars nor Star Trek were a particularly good match for what was going on in Star Frontiers and I lacked the Golden Age of Sci-Fi chops to recognize what was happening here. But as I get older some parts of the game have started to make more sense to me. Here's one piece that seemed lame back then but I kinda get now: the spaceship skills. where registered members can legally download the old stuff. This chart had to be a bit of a heartbreaker for folks who already had PCs they wanted to move into space careers. My mind boggles at the sheer number of XP needed to be a Han Solo type, who could pilot a ship, plot a course, conduct repairs and man the laser cannons. Such a character would need almost superhuman levels of skill mastery. So let's go with that for a moment. In Traveller Pilot is a cool skill but not that much harder to acquire than learning how to brain someone with a club. 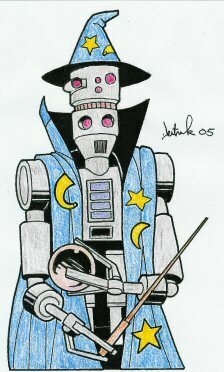 But in the Star Frontiers universe you need a pretty good grasp of computers and a total mastery of technology (skills are rated level one to six) just to get in to piloting school. Navigation through hyperspace is such a complicated task that only the most elite of computer operators can even attempt to plot a jump course. The best analog here, I think, is the heyday of the American space program. Space ain't for amateurs. Only the best of the best of the best in various terrestrial professions have the chops to learn space skills. Test pilots and aces are allowed near the controls of spacecraft. No one else can cut it behind the wheel of these multi-zillion credit wonders of technology. If you want to be trusted with the cannon on a spacecraft you need to prove that you've mastered smaller weapons. Basically, anyone with even a single level of Piloting, Astrogation, Engineering, Rocket Weapons or Energy Weapons is officially As Cool As An Astronaut. Younger readers may not remember this, but there was actually a time when pretty much everyone agreed that astronaut was the coolest job in the world. They were like real life Captain Kirks living among us mere mortals, but working among the stars. So if I ever ran Star Frontiers again, that's how I would do it. Space travel on the Frontier is still a new and exciting thing, like the glamour of the 60's Jet Set/Space Age but writ large. Starting PCs dream of joining the elite, those who are trusted to operate the small fleet of starships operated by the United Planetary Federation spacefleet, the richest planetary governments and the handful of interstellar corporations. Every spacer has a cool nickname like Buzz or Deke and walks around with the unmistakeable swagger that comes from knowing they have the Right Stuff. I noticed this as well when I finally obtained my copy of Knight Hawks, it threw a kink in my desire to run a "Rogue Squadron" type game. That and the fact that G+ is not conducive to hex & chit war gaming with a squad of people. I am digging the rules for skills however and have fallen in love with the stat generation - it is similar to the FFG rules for Warhammer 40k (the whole line is 2d10+ 30 or more). Since Science Fiction gaming is my preference over most other types, I certainly played my fair share of Star Frontiers. One interesting twist, and one I am surprised more people didn't do, was simply add skills called 'Starship Piloting' and 'Navigation' to Alpha Dawn. I know it may over simplify things for many but really, did we need more than that in those days? So basically the pilots were anyone who took those two piloting skills. The ships engineer was still the same tech guy who fixed robots and other mechanical devices. Weapons were handled by the military/combat specialist. Hours and hours of fun in space followed. Does anyone else find it strange that the pilot is a better technician than the engineer? I always read that as a fudge because there was no vehicle operation skills in the original game. Maybe you have to work your way up to Pilot. Learn everything there is to know about the ship before you are allowed to take the controls. Imagine if people had to become mechanics before driving a car. Was it like that a century ago when cars first came into being? @SAROE it was for a while, but the sport of motor racing produced a class of professional drivers who were not also mechanics. In the case of aviation it was WW1 that separated pilots from mechanics: the aviator before 1914 was almost always a mechanic and quite often also an aircraft designer. Which is an interesting furrow to explore, I think. The last time I ran Star Frontiers regularly, we noticed something unusual. Starting PCs aren't actually given enough money to fully outfit themselves. 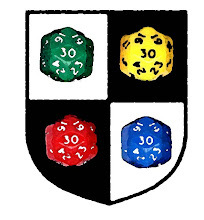 In a moment's whimsy, I explained to the players that this was because their characters were losers, a concept we ran with that paid entertaining dividends--one guy had rolled a totally average-statted Human he named John Doe. Another played a Dralasite bio-social PSA who of course was relegated to working the suicide hotline John Doe called in a low moment. "Scrubs in Space" became a motif, as they slummed around Spaceport malls, cheesy Starliner casinos, and alleyway trash bins OF THE FUTURE. I ought to have had them end up in a laundromat. That sounds oddly fun. Red Dwarf-esque. +1 - that sounds like a freeking® great game! Yeah! Even when these guys fell afoul of a Sathar plot it was mostly an excuse to order room service and hang out with Dralasites. Oh, and destroy every robot they saw, since ONE turned out to be wired to spy on them, the military PSA figured every single other one was too. But she'd been shipped to Gran Quivera in an interstellar packing crate, so she was in a fould frame of mind. We never got Knight Hawks. We just saw the Alpha Dawn game as not being "about" space ship travel. It was "about" being space marines/raiders. Some joker flies us around to strange, exotic planets with strange, exotic aliens for us to kill. Played the Hell out of it that way. "Sgt. Abdomen "Abe" Thorax, Vrusk rifleman, reporting for duty. What do you want blowed up?" "Traveling through hyperspace ain't like dusting crops, boy!" Alpha Dawn was THE sci-fi game for our group until the WEG Star Wars game came around. And we never had a problem with there being no spaceships, and never had Knight Hawks. One of our friends owned that and we kind of just shrugged and ignored it... looked too complex for mere space travel rules. In out Alpha Dawn games piloting was about as exciting or glamorous as driving a train or a bus. Those were the people who took the exciting people (PCs) from place to place. Space travel was more similar to how it seems in movies like Alien or Total Recall. Just a boring travel job, not a bunch of small starfighters battling it out or whatever. It plays well like that, too. Wow. It's hard for me to imagine a Space Adventure Science Fiction RPG played without space travel or starship involvement. I agree, although the old GURPS Humanx Commonwealth supplement noted that 90% of those books take place planetside as well. It's a thing. Also because in the Humanx Commonwealth ships are almost fully automated. Pilots are practically just an emergency back up system. Not much fun for a PC. I'm all for more dudes swaggering in RPGs, perhaps even some impertinent strutting? I've always felt that the "do-anything" nature of many of the Star Wars characters (especially in the expanded universe nonsense) is ridiculous: special forces commando and crack fighter pilot who also happens to be a Jedi or at least becomes one. I loved Alpha Dawn but the nerds I played with in high school didn't like it so much. I'm just saying, if a Star Frontiers game were to pop up on G+ some time, I'd play it. Particularly if it were something like Jayson's Scrubs in Space game. You flatter me! I will note that there is an example in the Alpha Dawn rulebook discussing layovers of all things, with two regular Joes stuck on-planet for a few days, where the book suggests they can do some sight-seeing, look for work, or get involved in a short adventure. Something about the resonates with me, just the whole itinerant, junk food-scarfing, spaceport-haunting je ne sais quoi. Dont forget, that once you get a Piloting skill of 1 - after you get a "good grasp of computers and a total mastery of technology" - you are limited to system ships, and then (after gaining a level) you can learn how to operate a ship the size of an Assault Scout. Being well-armed, highly mobile, and with a compliment of 5-8 crewmen: the Assault Scout was built for wayfaring adventures. So you really have to work your way to operate such a craft. Joining the Gollwin Academy is your best option, as you gain one Gunnery skill at level 1 and Piloting, Engineering or Astrogation at level 2 (with a successful Logic test, and the option to test for the other two skills, if that failes) and your "foundation" skills are raised to the required levels, if you fall short. Now that is some NASA-like training! _\\\ You can also use your status as a UPF Officer to join a planetary militia - like the Clarion Royal Marines - at full rank! This reminds me of Farscape and John Crichton, you often forgot he was an extremely clever astronaut type until suddenly he was spouting off a load of critical situation knowledge. Still, all the aliens considered him stupid by their standards! Great insight, Jeff.... We pretty much ignored Knight Hawks and played it as Anonymous (above) did: we were the cargo that paid to be delivered. We played space warfare akin to FTL submarine warfare. There was a lot of hit-and-miss, you were never sure where the enemy was, etc. In other words, there really wasn't a lot of ship-to-ship contact; all the fun was groundside. The ships became little more than mobile motels and flying flophouses. They were the bus we took from adventure to adventure. 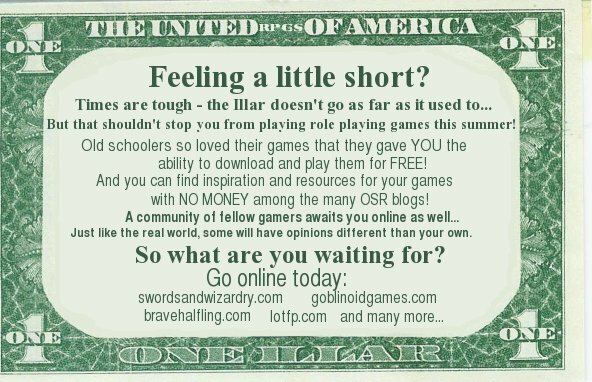 We took it as TSR trying to horn in on GDW's success with Traveller, and we never did get around to playing Star Frontiers even though I bought it right when it came out. I definitely did use the counters and the starport map for several Traveller sessions though, they were awesome for that, and we statted out the aliens for Traveller as well. I'm not sure if the releases were literally simultaneous, but SF and Gangbusters showed up on our small-town shelves about the same time. Between my friends and I, we bought both, but ended up playing Gangbusters rather than SF. I'm not sure if we ever even made it past chargen, actually. By the time Star Frontiers came out we had been playing Traveller for 4 or 5 years. One of the gang had bought it, all we could see was a morras of loosely related tables where Traveller had a simple core mechanic of 8+ on 2d6. Couple that it had all the feel of TV SF of the period (Battlestar Galatic, and Buck Rogers), while we were playing characters that looked and felt like Ensign Flandry or Van Rijn or James Bolivar DiGriz (God Bless Harry Harrison's soul), and many other Literary SF Characters. But despite all that, recently I have thought it would a great system to play out Redshirts with. The system inherent awkwardness just seems to be an amusing match. I want to mix Transmetropolitan and Futurama and maybe a dash of Red Dwarf for setting and run it with Star Frontiers. I never got a chance to run or play the game and I never bought in to Knight Hawks. It was a long time between Alpha Dawn and WEG's Star Wars for me, and since I never had more than Alpha Dawn, Star Wars hooked me good. I love the notion of running a sci fi game sort of like Red Dwarf meets The Terminal. That "elite" rationale is something that eluded my brother and I way back then, or recently. We played the first few modules for SF when Alpha Dawn came out, then the first 2 when Knight Hawks arrived. I definitely remember taking KH on the road for a long trip to grandparents one summer, and me playing a handful of characters while my brother GMed. Just last summer, I dug the game out and applied Savage Worlds rules to spring it on my then-12-year old and his pals, after some time getting inspired from the Renaissance website. 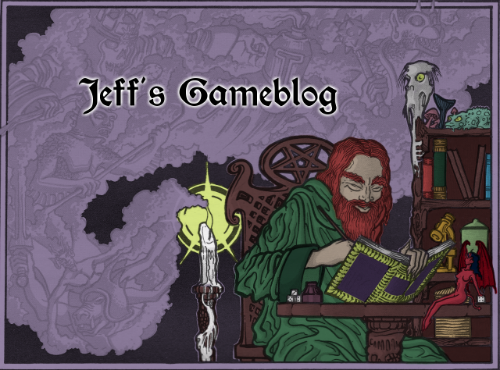 Have many good RPGs can play in the explore. I'm hard when setup game in my PC.